Just like adults, kids need adjustable furniture to ensure that they do not strain while studying or doing other activities. Otherwise, they risk getting injuries as a result of straining their backs and body. Adjustable kids furniture can be used in kids classrooms, waiting rooms and offices catering to children. Since they are adjustable, kids of different weights and heights can use them. There are quite a wide variety of adjustable kids furniture to choose from depending on the room you want to furnish, and the activities they will be used for. 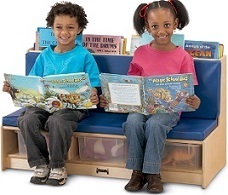 Kids Storage Furniture - Storage ottomans, storage benches and literacy towers assure you that the kids' space will never be messy. They can be used to store many things, including toys, books and coloring activities. This will prevent adults and even kids from tripping over them. The kids storage furniture comes in many colors and materials to match space reserved for children. Kids Waiting Room Furniture - With options like a two-sided couch with a center partition where children's books can be stored, literacy tower, study table and write and wipe easel are ideal to keep kids busy while waiting in your reception space.